My 1986 GT hatchback has a sunroof. 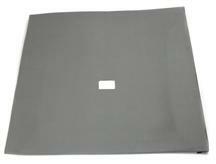 Does this #LRS-1808AH-ABS headliner for 85/86 hatchback accommodate the sunroof? And if so, how does that work?